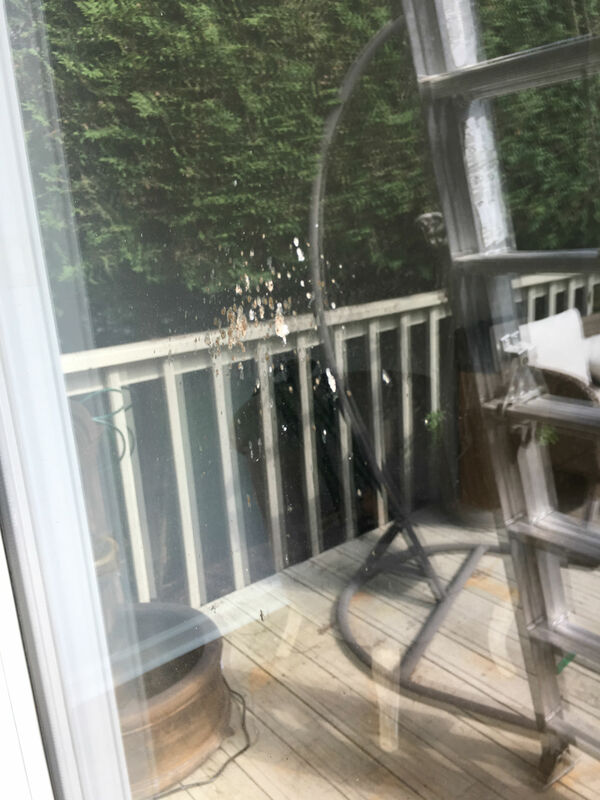 Welcome to Fish Window Cleaning of Wayne, NJ, Pompton Lakes, NJ, Ridgewood, NJ, Franklin Lakes, NJ, Mahwah, NJ, Wyckoff, NJ, Allendale, NJ, Montville, NJ, Kinnelon, NJ, Lincoln Park, NJ, and Western Paramus, NJ! When you choose Fish Window Cleaning, we are committed to your satisfaction! We don't think you should trust just anyone to come into your home or business to do a great job. 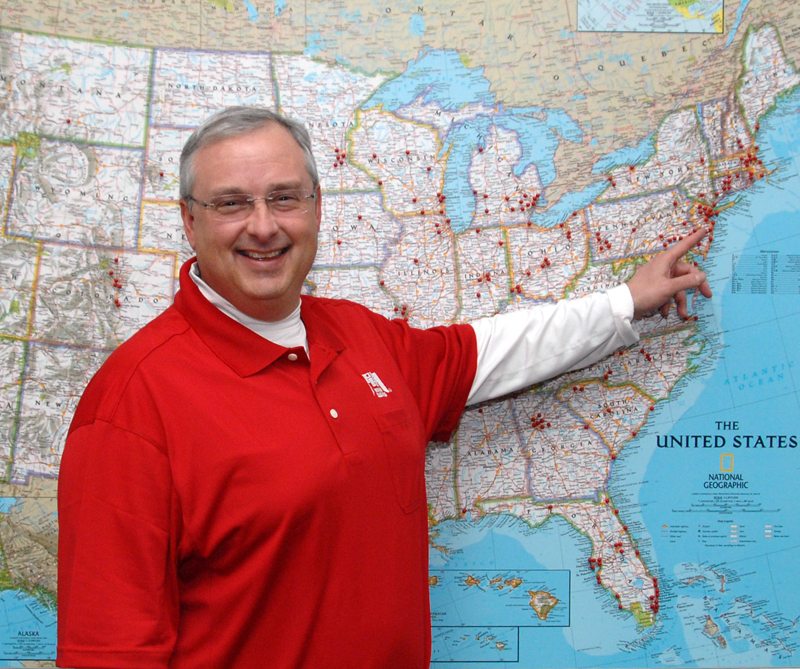 Our uniformed team is bonded and insured. All of our technicians have undergone extensive training and are true professionals. 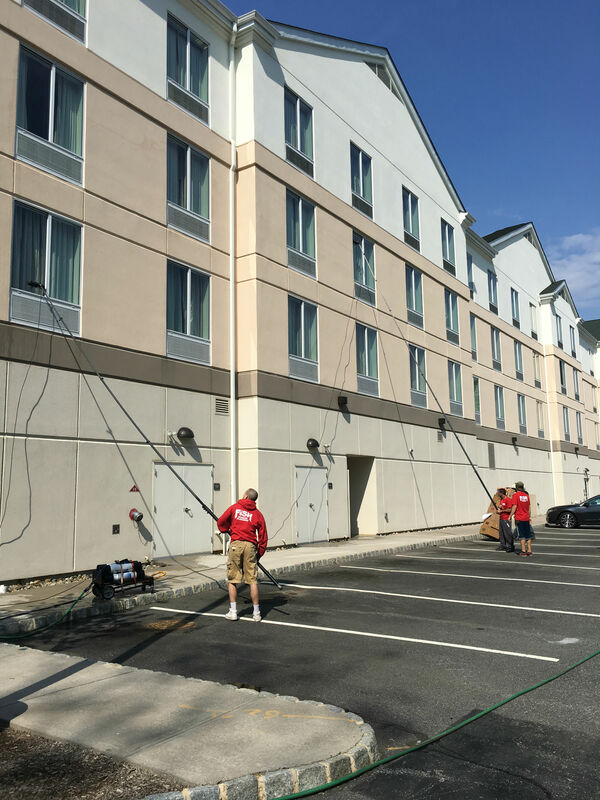 You can trust us to keep your scheduled appointment, stand behind our work, and provide you the best value in window cleaning and related services. Most importantly, we are committed to your satisfaction! 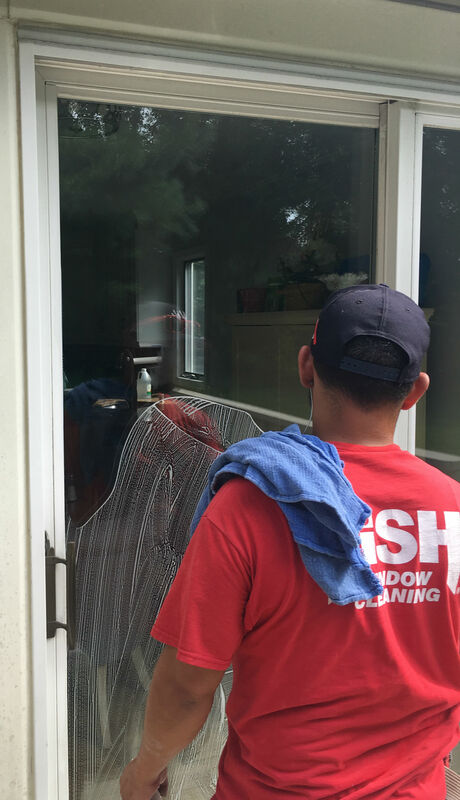 If you're looking for a reliable, bonded, and insured residential window cleaning company, look no further Fish Window Cleaning is the nation's leader in professional window cleaning with over 250 locations across the counrty. Whether you're tackling spring cleaning, preparing for the holidays, or just tired of looking through dirty windows, we can help INSIDE & OUTSIDE! 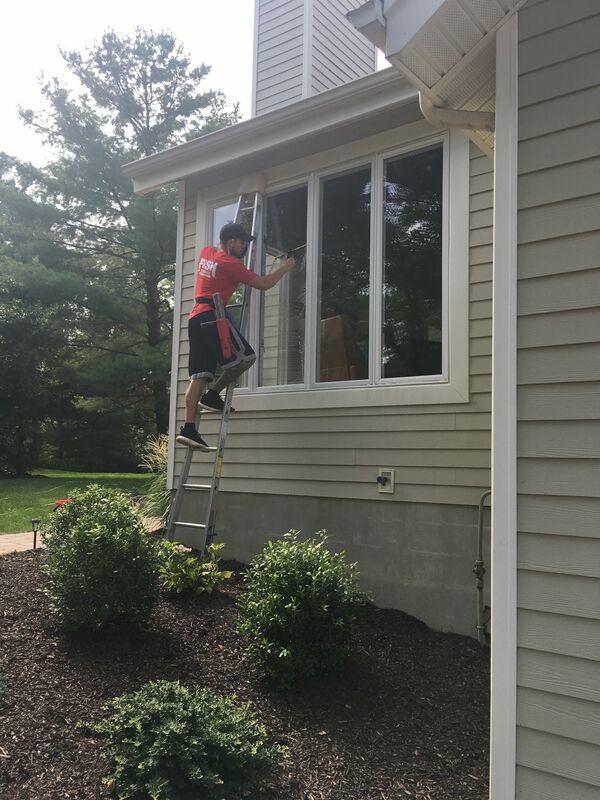 Learn more about our residential window cleaning services. That is not dirt - yuck! We make it bright & right! We go UP so you don't have to! "TOTALLY HAPPY with Fish Window Cleaning! From start to finish, TOTAL PRO's. The owner was great to deal with, & the crew was so respectful of our house. They arrived on time, got right to work, offered to wear shoe-booties for interior cleaning, did immaculate work, and cleaned up, leaving no traces except gleaming windows and sills and a power washed exterior that all LOOK LIKE NEW. Our whole house looks younger, feels brighter inside. I really can't believe they got all the grime off the sills, got to every high window, and every time I peeked out at the crew, they were working. They moved the ladders with care. I already recommended them to neighbors. Really impressed. This is the first review I've ever posted on-line, so that says it all to me about FISH. "Your crew just left a little while ago. I just wanted to let you know that they did a fantastic job. My windows were pretty bad, and now they sparkle. They were very nice young men and they were a pleasure to have in my home. I will definitely recommend you to my friends and family. Ryan did my chandelier, and really took care to make sure it looked beautiful. It is an antique, and has some permanent discoloration, but he made sure it was something in the glass before he gave up. I really appreciate that. At FISH – First Impressions Start Here. As business owners, we understand that your customers' perception of your business is extremely important. 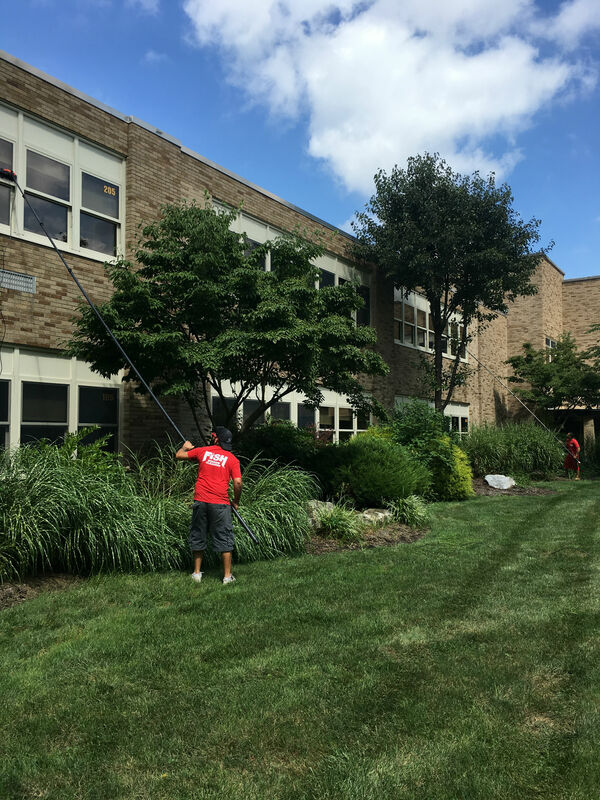 We are committed to treating your storefront, office, school or commercial building as if it were our own! Our window cleaners are uniformed, as well as licensed, bonded, and insured. We also offer custom maintenance programs that meet your needs, schedule, and budget all year long. Our team cleans quickly, quietly and neatly so we won't disturb your employees, or more importantly, your customers. 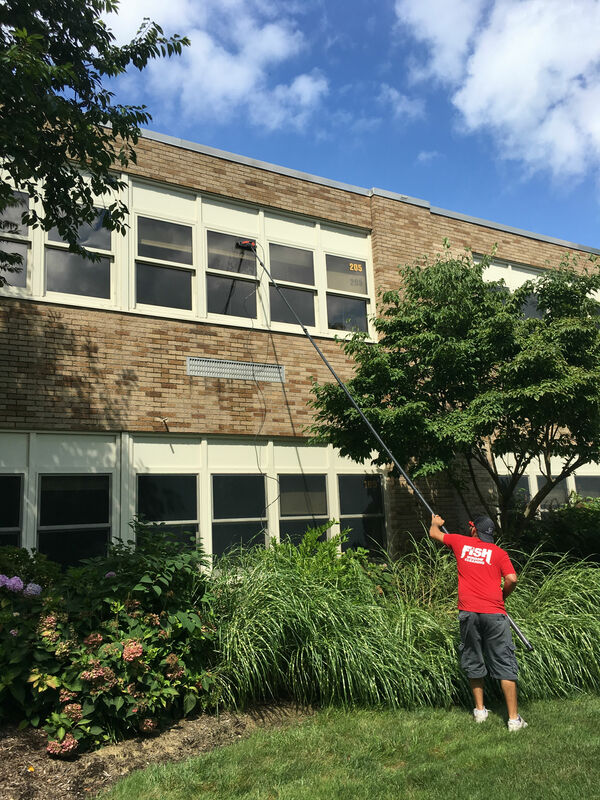 Learn more about our commercial window cleaning services. Business owners & property management firms - request a free estimate plus ask about our maintenance programs and how they can be tailored to your specific needs. Why has Fish Window Cleaning grown to be the largest window cleaning company in the world? Thank you for visiting our website! Feel free to call us with any questions at (973) 831-2300 or email as at rhewins@fishwindowcleaning.com. It would be our pleasure to add you to our list of satisfied window cleaning customers. We look forward to hearing from you soon!